The Kokuyo Campus Wide notebook looks pretty great. 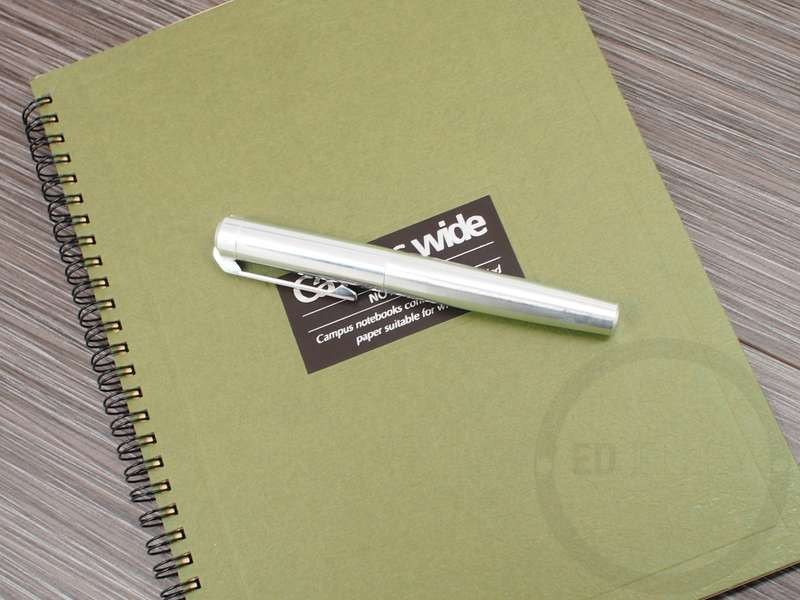 The olive green, heavy cardboard covers, paired with the black double wire binding makes for an awesome looking notebook. Huge thanks to my friends over at JetPens for sending over the book for review! Their site lists the book as being “fountain pen friendly” but I don’t think I’m with them on that 100%. Enjoy the review! 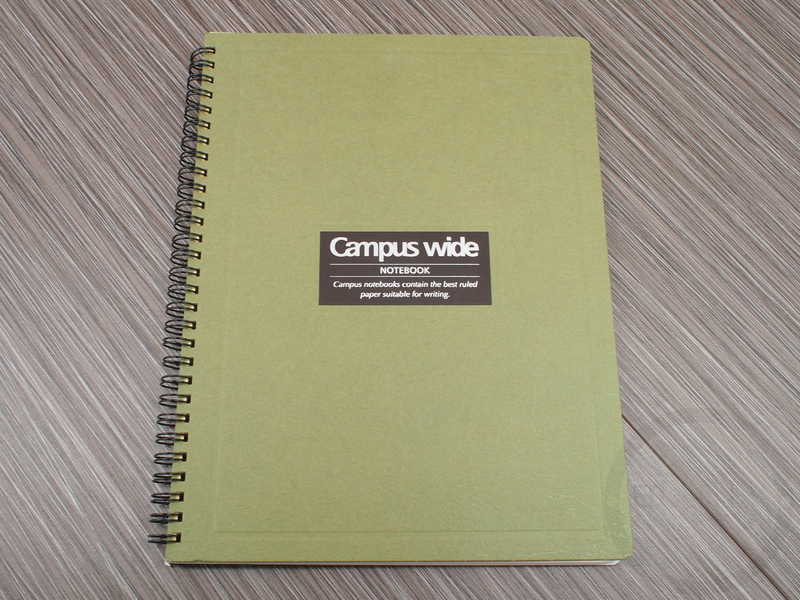 The Campus Wide notebook in olive green looks awesome. All of the color and design choices in the book compliment each other so well. The off-white paper has a maroon upper and lower line, with light grey lines in between. The black wire binding adds some nice contrast and is a welcomed departure from the standard silver metal. 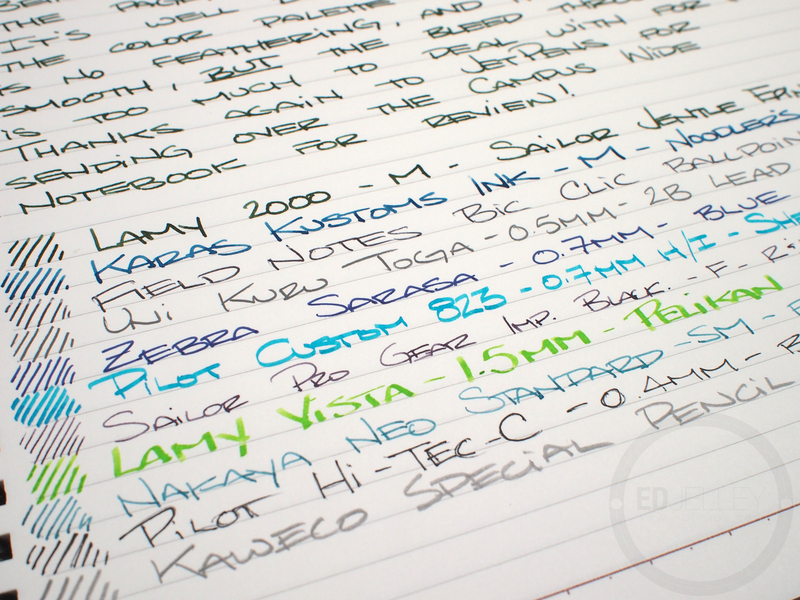 I love the color palette of the notebook, dark green and maroon are two of my favorite colors, and coincidentally the first colors of fountain pen ink I had ever purchased (Diamine Evergreen and Diamine Oxblood). The notebook is also constructed quite well. The heavy stock rigid covers make it easy to write anywhere, for the handwritten portion of the review I was leaning on my lap. 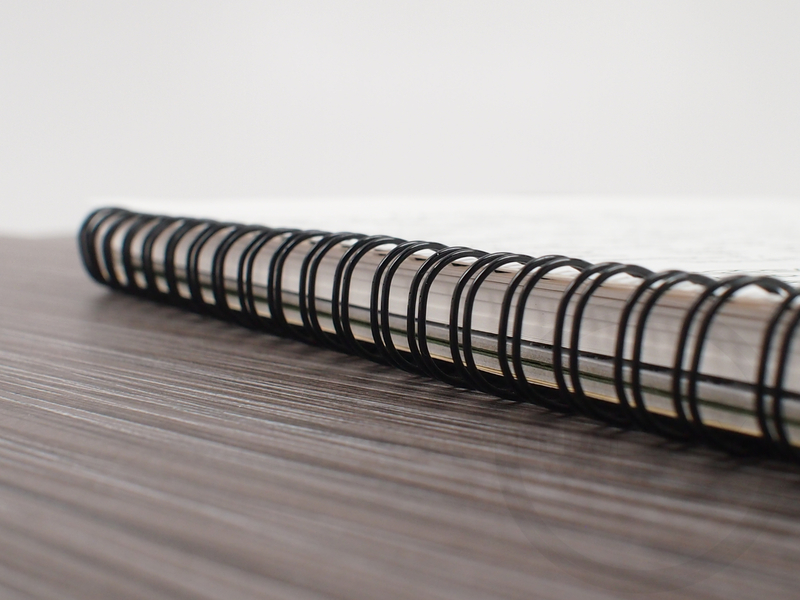 The double wire binding can take a beating, and aren’t easily bent, making the pages easy to turn. 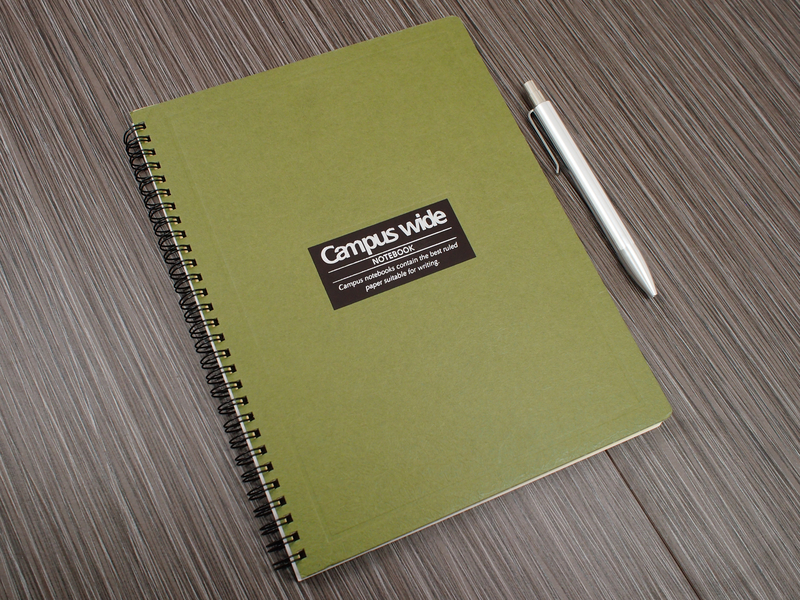 The Campus Wide notebook is a winner in terms of appearance and construction. The 70g off-white paper is smooth, but it’s having quite the show through problem. There’s no feathering and ink dries on the page pretty quick. I imagine an extra fine nib would work okay, but if you’re using the paper to take notes with a fountain pen, you might not have the best time. This paper would definitely be better suited to gel or ballpoint pens (or any other non-liquid based ink). The paper is listed as fountain pen friendly, but I don’t think I agree. I would like to be able to use both sides of the sheet, but the showing/bleeding is a bit too much. 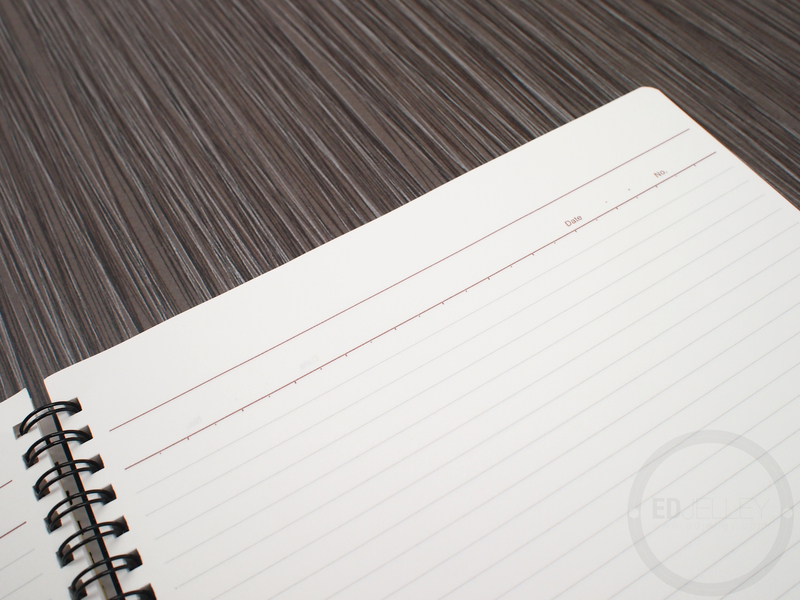 I much prefer the Maruman Mnemosyne B5 notebook for a fountain pen friendly B5 notebook with off-white paper. The off-white paper is easy on the eyes. Mix that with the wubtle grey micro-dot ruling and maroon accents, and you have a really nice looking page. There’s a spot in the header for the date and page number, which is a nice touch. The 6mm rule nicely compliments the size of the page, as well as my handwriting. It’s slightly narrower than the 7mm rule I’m used to, but I still like it. There are other versions of the book with different colored covers with slightly different ruling spacing. Even though the paper is off-white, it still does a good job of showing off the color of the ink. Once again, it’s a shame that the paper isn’t slightly more ink-resistant, as I really like the features of the book. Oh how I wish the paper in this book was slightly heavier. If you don’t mind using only one side of the page, you may like the book. It’s well designed and I like the color palette quite a bit. It’s understated and simple, right up my alley. There’s no feathering and it’s smooth to write on, but the bleed through is just a bit too much for me to give it the seal of approval. If you need a great looking notebook to use with other types of pens, definitely consider this one. 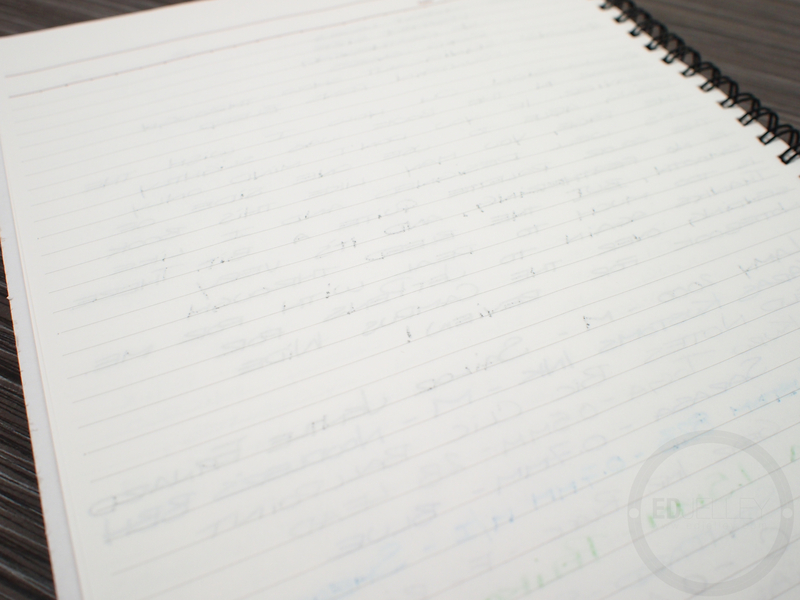 Thanks again to JetPens for sending over the notebook for review!